I just have to come out and say this first off..there is SO much to love about this film. I honestly don’t even know where to begin. I know what I would like to focus on, which is the incredible cast. Of which I will speak of at lengths. But, I feel as though it would be behoove me to mention some of the other aspects that made The Confessions one of the best films to be released this year (for those of you in America, anyway). 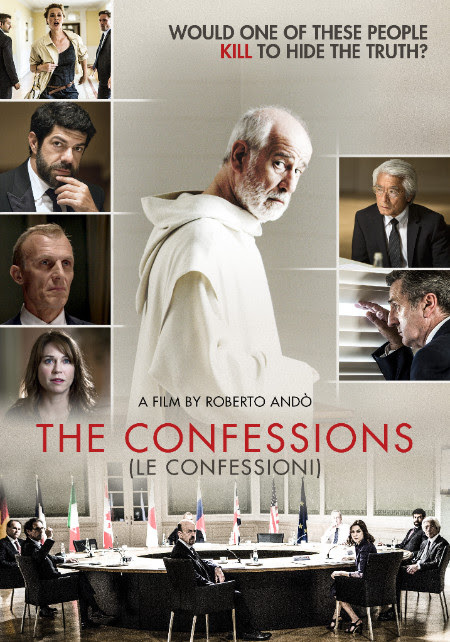 The Confessions (or Le Confessioni) could easily be classified as an Italian film because, well, it’s made by and featuring Italians, but almost entirely set out of Italy and does not feature prominent Italian speaking roles, although much of it is. Confusing enough? Just go back to the first sentence of this article, and remember that the story takes place around a G8 meeting, and it should all make sense. Sadly though, I can tell that if this film had been a Hollywood production, it would have all been in English just for convenience sake. Thankfully it was not. No, this is not a Hollywood film, this is a true hearted and brilliant multi-cultured film. But, for the sake of argument and probably unnecessary categorization, let’s call it an Italian masterpiece. Although I would prefer to simply call it a masterpiece. To start out with, filmmaker Roberto Andò had the brilliant mind to stack the deck a bit with an amazing script he co-wrote with Angelo Pasquini, as well as having Maurizio Calvesi work the cinematography. The look of this film is definitely one of the highlights, and truly pulls the words from the script out and into our ears like gentle daggers. It is a story that seems simple at times, but with the perfect bit of informational neglect, it keeps you on your toes and looks absolutely stunning while it does. With such a diverse and inscrutable group of characters, there was also no way this film wasn’t going to be amazing. Even then, it exceeded so many expectations. Speaking of the group of characters, this is where the film truly gripped me like so few films coming out today seem to do. This was one hell of a cast. Obviously I have to state that Toni Servillo was absolutely phenomenal, and has again rose in the ranks as one of the finest actors of this modern time. While his role as Roberto Satus in The Confessions may not be as entirely fascinating as compared to his brilliance as the charasmatic Jep Gambardella in another amazing film, The Great Beauty, it simply shows that his versatility is absolutely amazing. We seriously need to see more of this guy in our world. And I mean in no way take away from his performance in this film, obviously. They were two entirely different roles, both some superbly well. Again, we need MORE Toni Servillo in our lives. But, Toni couldn’t do it alone, and thankfully he didn’t have to! Literally every person in this film was absolutely incredible in handling their own, right down to the cute little Ben, the crazily obedient canine who played Rolf. Seriously, everyone in this film was so great, it is almost unfair to namedrop just a few. But, I guess I will: Marie-Josée Croze as the Canadian minister was a character that I felt was underplayed (or maybe I personally just wanted to see more of her) a bit, but every moment that Marie-Josée was on screen, she was absolutely dynamite. Connie Nielsen (who is having a great year by the way, with the success of Wonder Woman as well) was all you would expect her to be as Claire Smith, which is nothing short of brilliant. Nielson is person I feel as though we need to see more of, and now that she has made her way into the DC universe, I feel like we will definitely be hearing more form her in the near future. But on a personal level, I am always going to adore her most for her work here in The Confessions. Seriously folks, everyone in this film was absolutely incredible. Daniel Auteuil was just damn right spooky at times, and quite unpredictable as well! He had a wonderfully written part to work with, and he did it absolutely stunningly. Again folks, I honestly cannot say enough good things about The Confessions. It is a beautiful tale of deceit, greed, and death that is as visually stunning as it is brilliantly written. For anyone seeking a true artistic experience in the world of cinema, I cannot recommend this amazing work of art any more. If I did the star rating thing, I would give this an easy 10 stars. Out of 5! Yes, It is that great. So check it out! Check out a trailer for The Confessions which will receive a U.S. nationwide release this Friday, July 7th, 2017.